Tune your B and E strings up to C and F respectively and you’re in all fourths tuning. The first time I did this it was truly a revelation to me to have a symmetrical fretboard and get rid of that major third ‘bump’ from the G to B string in standard tuning. Everything suddenly became far more manageable and logical. To be honest, there isn’t much in the way of material for fourths tuning on guitar, so I decided to write a chords and inversions book for anyone wishing to expand their knowledge of chords in fourths tuning, or to help with the transition from standard to fourths tuning. 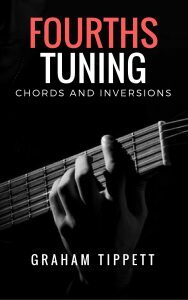 There are over 30 types of chords and inversions in this book, including open chords, closed and spread voiced triads, plus virtually every other type of chord and inversion you’ll need to play anything from rock to jazz.